Upon walking in, I noticed an engaging piece of art against the wall. It gave the room a warm feeling. Sebastian Goldstein, owner of Absalom’s Emporium, explained that the piece of art by Parris Ashley is one of the great additions to his business. This painting was put in place to match the name of the business. Not only does it draw people’s attention, but the intricate details help set the mood. The piece of art is a visual depiction of the name of the business itself. 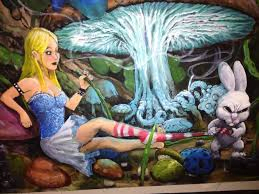 The painting shows a caterpillar, a fictional character named Absalom from Alice in Wonderland, smoking a hookah. Sebastian attended Frostburg State University and majored in Political Science. He started his business on Main Street in June of 2012 because he loved smoking hookah and wanted to take a bold step by turning his hobby into a business. It turned out that this was a great decision for Sebastian; his business thrives because he is friendly to his customers, he follows all legal measures such as checking the ID’s of everyone who comes into his business, and he is well educated on everything that he sells or recommends for others to buy. Not only was he able to attract customers through his warm speech and respect, but he understood the mechanism and effects of hookah. Only a small population knew about hookah prior to his business opening, but he broadened his market by sharing his knowledge and the enjoyment of hookah. This mixture of friendliness and knowledge gave him the solid ground to have a successful business. Sebastian’s friendliness also comes with some humor. When asked what is his definition of success, he replied saying, “Happy with tens of billions of dollars.” He joked that he is currently competing with Mark Zuckerberg, though Zuckerberg is not aware, but Sebastian will not stop until he is a billionaire as well. On a more serious note, Sebastian explained that owning a business has its advantages and disadvantages. He explained that some days can be very stressful; his life is his business, and he constantly needs go to the store to pick up more supplies, he rarely gets to go on vacation, he’s always processing the books, he barely gets enough rest, and he constantly has to drive back and forth to his second location in Silver Spring. He also explained that there are many advantages to being an entrepreneur. He enjoys knowing that no one can tell him how to do his job, and he gets to smoke hookah all day. Sebastian decided to place his business in Frostburg because he understood his market, and he knew that Frostburg had what he needed to help him grow from what his business was then to what it is now. He explained that his market is young adults, especially the students from Frostburg State University. Other than his own business, he explained that he admires some other businesses in Frostburg. One of the businesses he mentioned was Frostburg Freeze. 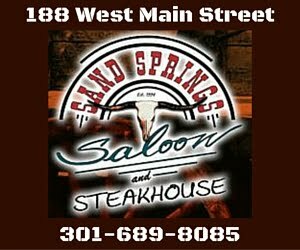 He admires them because of their “longevity,” and he also talks about their consistency and his love for their high quality service over the years. Despite already having two locations, Sebastian explained that he would like to see his business grow even larger and more prosperous with possible other locations. Find out more about Absalom’s Emporium by visiting their website or Facebook, or stop in their location at 95 E. Main Street in Frostburg. Absalom’s is open Monday through Thursday from noon until 10 PM, and noon to midnight on Fridays and Saturdays.